This all creatures animal exploitation photo gallery about Pigs is being presented to show the public the difference between the cute animals we see in advertising and picture in our minds and the reality that exists in the world. (Pig Exploitation - Transporting - 03) In her book, Slaughterhouse, Gail Eisnitz described the transporting of pigs to slaughter on frigid winter days, and the actual freezing of some pigs to the side of the truck. 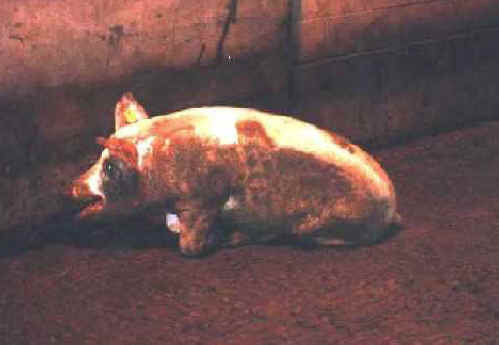 Upon arrival at the slaughterhouse they are pulled loose, leaving chunks of flesh behind. We believe that is what happened to this pig.